Dwight Eschliman, Text by Steve Ettlinger. Ingredients: A Visual Exploration of 75 Additives & 25 Food Products. Regan Arts, 2015. The photographer and writer went through the grocery store and jotted down every food ingredient they could find—from Acesulfame potassium to xanthan gum. Dwight Eschliman acquired samples of each ingredient in its pure form, arranged them in piles, and took photographs. Steve Ettlinger provided their Code of Federal Regulations numbers, chemical structures, and brief descriptions of how they are used. The photographs are gorgeous. 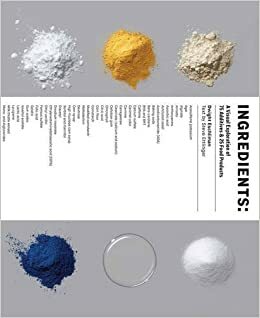 Even though all the ingredients look like piles of salt, their textures and colors are sufficiently different to make this book weirdly fascinating.